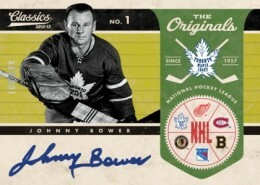 Hockey card collectors love digging into the past and celebrating the heroes of past generations. From the legends of the Original Six to the standouts from the 80s and 90s, the game has a rich history the hobby can draw from. 2012-13 Panini Classics Signatures Hockey applies the autograph-per-pack concept to a roster that consists entirely of retired players. 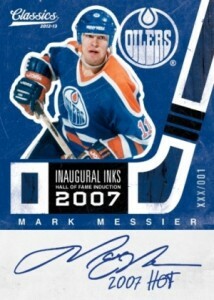 The sense of nostalgia in 2012-13 Panini Classics Signatures Hockey goes beyond the names on the checklist. Collectors can also look forward to see old logos and jerseys from some of the NHL's defunct and relocated teams. Every six-pack box delivers a half-dozen autographs. Besides basic signature cards that have a close resemblance to the base set, collectors can hunt for several different insert sets. Classic Lines Triple Autographs brings together teammates who achieved big things together. Social Signatures return, combining both an autograph and the player's Twitter ID. Other autograph sets include Classic Combos, which have two signatures, Inaugural Ink and Notable Nicknames. From a breaker's standpoint, case hits include two Classic Combos, a Notable Nicknames card, an Inaugural Inks card and three Social Signatures. Rating of 4 – Love the aspect of retired only players being included. I like to collect vintage autographs and do some TTM requests as well. It’s nice to have a product that’s full of potential additions to my collection. The layout of the cards shown in the images are very nice as well – looks like a winner! Forgot to get the stars selected – just in case the stars are used to rank products. My all time favorite product is classics, whether it be football or basketball the 18 pack 3/4 hits per pack kind. 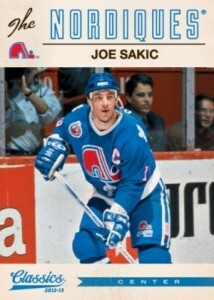 While I understand the new addition for the hockey fans, please keep it like the old more fun to break in my opinion. I’m starting to lose faith in the intelligence of hockey card collectors when they start spouting off how great this product is. I agree with Mr. Smith above, pure crap! Panini spews out garbage like this all the time and you folks that eat it up are nothing more than enablers. True hockey fans should voice your displeasure with the NHL, the players, the owners, and especially the grand pooba of douche bags Gary Bettman by letting all this trash rotting on the shelf. Panini Classics is already down 40-50 bucks a box..do not buy at 180. Should be down below 100 by summer. More crap from Panini. I love the clean look and retro feel I really really do, however, set is WAY to large, and WAY TO EXPENSIVE! Bought one box for $180 at LCS. 1st pack, i thought this product was going to knock it out of the park – Banner Number SP Patrick Roy and Inaugral INKS Patrick Roy /100! After that it was all downhill and disapointing, no more SPs and the “Classic” autos consisted of Essensa, Berube, Maruk, Cloutier, and Bruce Shoebottom? Really? This guy played 35 games over the course of 3 seasons and his is a “Classic” auto one can expect to pull from a product with a $30 per pack price point? Other than the Roy, these autos don’t scream “Classic” to me. I know not every pack can be a winner, but my experience is that the value is no where near the price point here. A really great idea for a product by Panini that may have missed the mark in execution. Josh � Could be they planned to have other players but didn’t get approvals in time. I like the way the cards look. The autograph selection is great and are all hard signed. I agree with Josh above…what’s with the missing numbers in the checklist for the base product? Years from now when you’ll pull the set up, you’ll be wondering why the missing numbers and think your set is not complete. Bad decision the miss the numbers. Joey � No sure why here, but sometimes players will commit to signing then back out/not sign. It’s doubtful by design. I suspect that’s why a lot of autographs are either unnumbered now or use initials. Pulled Adam Foote Auto #49 out of a pack of 2013-14 Contenders. Interesting. Who would not love this set, challenging but fun. 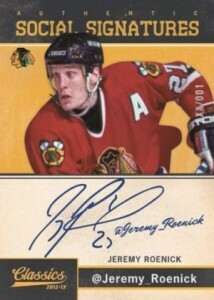 I wish Upper Deck had hard signed cards all the time like this set. Why do you not like it?